The program was presented by the AFRH chaplains with closing remarks by Susan Bryhan, Administrator, AFRH-Washington. 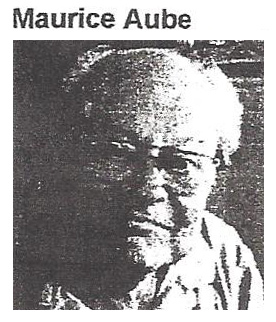 Maurice “Moe” Roma Aube passed away at his home in Spring Hill, Florida on Monday, June 11, 2018 at the age of 85. Born in Hartford, Connecticut to Roma Aube and Leona (Fontain) Aube, Moe Graduated from Hartford Technical School in 1952. 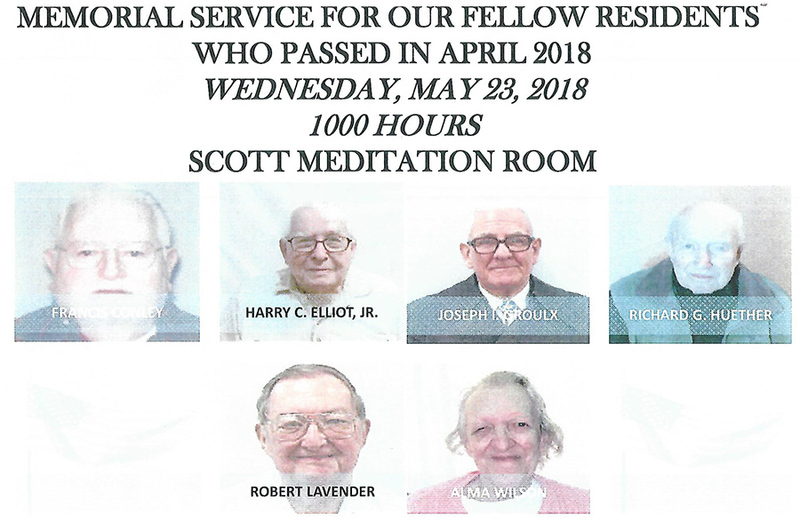 He served in the United States Navy from 1952-1955 and relocated to Bridgeport, Connecticut in 1957 while working at Avco Lycoming where he met his beloved wife of 57 years, Joan Rickhey. He was a devoted father and friend. He and his wife, Joan, raised three children and enjoyed family and friends in Bridgeport on Charcol Pond. Please help the family honor him by considering donating in Moe’s name to the National Association of American Veterans, Inc.
visit https://www.naavets.org to DONATE TODAY! Thank you. 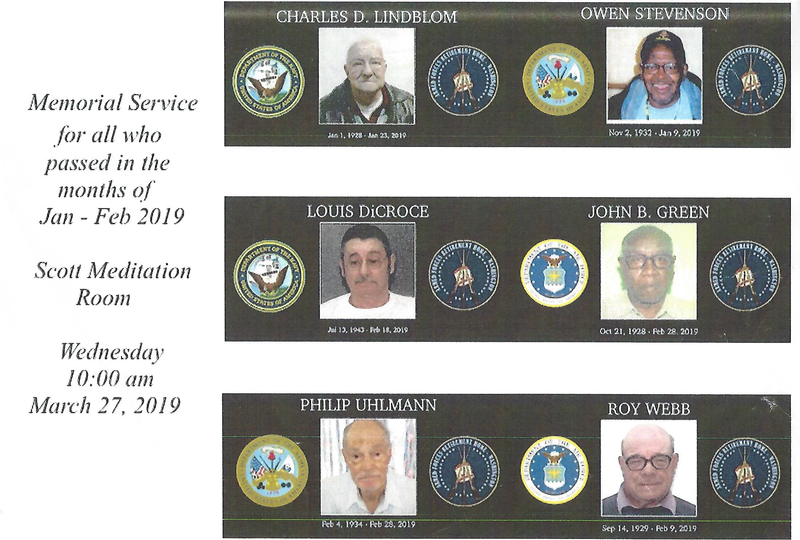 The program was presented by the AFRH chaplains with closing remarks by Michael Bayles, Acting Administrator at AFRH-Washington. 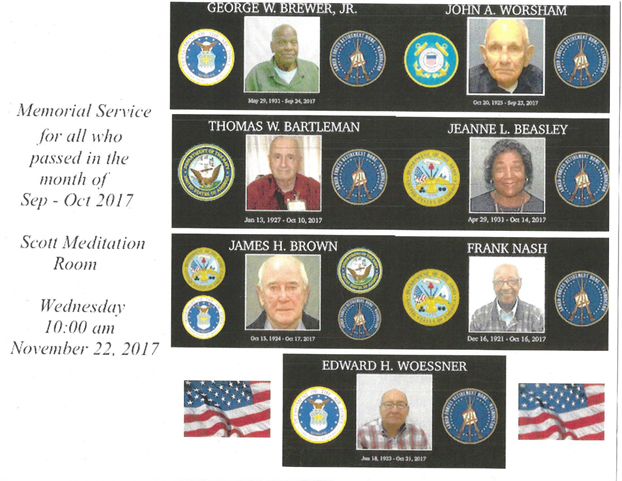 The program was presented by the AFRH chaplains with the closing remarks by Ronald Kartz, Chief, Resident Services at AFRH-Washington. 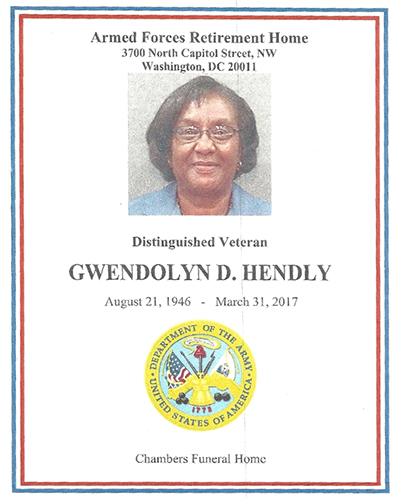 Staff Sergeant Gwendolyn Hendly served as a Practical Nurse in the United States Army for more than 14 years. She also served as Medical Non-Commissioned Officer (NCO). It appears that most of her service was in the medical field. Her total years in the military was twenty years. She received the following decorations, medals, and badges: Army Commendation Medal (2nd Oak Leaf Cluster); Army Good Conduct Medal (5th Award); National Defense Service Medal; NCO Professional Development Ribbon (3); Army Service Ribbon; Overseas Service Ribbon (2); and the M-16 Sharpshooter Badge. She will be greatly missed by those who knew and loved her. Take comfort—those who love God will be reunited in eternity. Bruce Alfred Johnson, 92, of Boynton Beach, Florida, passed away on Sunday, October 23. He was a resident of Spring Lake, New Jersey, for 57 years and a Florida resident for 35. As a youth, he was an Eagle Scout and a graduate of Asbury Park High School. Bruce served in World War II as a torpedo bomber stationed on the USS Ticonderoga. He saw action during the Battle of the Philippines, for which he was highly decorated. After the war, Bruce was captain of the nationally prominent University of Miami tennis team. He was later a three-time New Jersey State men’s tennis champion. After a 35-year business career, Bruce retired as EVP and COO of Triangle Industries, Holmdel, New Jersey. In his retirement, he participated on the senior men’s tennis circuit. 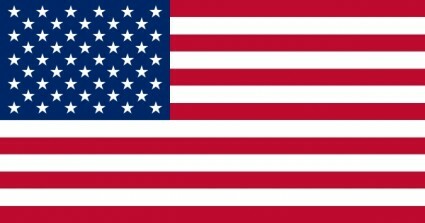 He victoriously represented the United States in the Gordon Trophy and Britannia Cup competitions and played well into his eighties. In addition, he wrote an autobiography, A Good Life Revisited, and This Above All. He leaves his wife of 63 years, Joan Sieminiski (“Joanz”), sister Paula Handler, son Stephen, daughter-in-law Alison, daughter Cynthia Bruckmann, son-in-law William, granddaughter Stephanie, grandsons Will (Melissa), Paul (Heather), and Scott, great-grandson Luke, and great-granddaughter Isabella. He was predeceased by an infant daughter, Mary Judith. A memorial service was held at Palm Beach Memorial. Bruce will be buried in South Florida National Cemetery in Lake Worth, Florida. In lieu of flowers, the family requests a donation to the National Association of American Veterans, www.naavets.org. NAAV’s Veteran Memorial is designed to recognize and remember the legacy of those who served in the United States Armed Forces and are now deceased into the comfort and care of God the Holy Spirit. It is also a time to remember loved ones of the deceased who feel the reality of mortal life, and when the presence of the Lord brings comfort, consolation, and hope. In memory of Johnnie H. Holt, Captain, U.S. Air Force (Retired) of Richmond, Virginia who passed away January 2015. Sorrow is a fleeting emotion, but love is infinite. In memory of James H. Nichols, Jr., of Richmond, Virginia who died on January 14, 2015. He leaves to mourn his cousin Bill Lawrence of Hoover, Alabama and two daughters Lynn Lloyd of Henrico, Virginia and Lisa Nichols of Arlington, Virginia; and dear friends CJ and Mary Wilcox of The Villages Florida. Take comfort-those who love will be reunited in eternity. You are in NAAV’s thoughts every step of the way. deepest sympathy to Lynda Rexrode a friend from his Class of 1958 and his son Ronny Mullins of Prosper, Texas and family. When the Lord calls our loved ones home, he leaves a gift of memories in exchange. NAAV is here if you want to talk.